Bluegemz’s Gem and Jewelry Musings. Discussion in 'Colored Gemstones' started by Bluegemz, Oct 12, 2018. OMG, I love that miniature portrait ring! I especially love the beveling on the stone, and the translucency. I love that about it too. And, the shape! Lovely. I’ve always wanted an agate navette ring. They were quite popular a few times, and I’ve seen some really gorgeous examples. One which I loved was extremely long, like half a fingers length. It was so dramatic, and yet amazingly understated. It’s been a desire of mine to collect more of them so that I can wear a few at a time on my right hand. I have 2, one early 1900’s, platinum diamonds and sapphire, and one is ‘the shard’ ring, Topaz diamonds on 18k. But they both fit the same finger. I’d love more of the type with the sapphires in it. Here they are...pls excuse the reposts! MissyBeaucoup, leslie1956, chatoyancy and 2 others like this. I do love your "shard" ring, but of course the sapphire one has my heart! MissyBeaucoup and stracci2000 like this. These are all lovely. I can imagine wearing 3 at a time! Stone Hunter, MissyBeaucoup and stracci2000 like this. You may repost that shard ring as many times as you like. As you well know, I adore that ring. MissyBeaucoup and Bluegemz like this. Ooohh I like the contrast rendered in this design. You are so sweet, @suzanne2 ! Thank you. That’s what struck me too, and it almost looks like a weaving because it seems very flat and 2 dimensional, like woven beads or a textile. Somehow flat pieces really focus the eye on the pattern. Love these! I don’t get get see imperial topaz often enough. Those sapphires are so pretty. I’m going to have to get a navette ring. You would look great with a navette ring! I can totally see it! ..thank you so much for the kind words. I really love natural colored topaz as it really is such a lovely stone. The pink, purple, red/ orange varieties I don’t see very often. Recently, I saw a woman with a huge ring with a brilliant orange, faceted stone in gold. I had to ask her about it...was sure that it was a spess because of the color. But, it was an amazing topaz! Really blew me away. You’re welcome. I am going to have to look for a navette ring. I love natural colored topaz too. It’s one of my favorite stones. I’m sure that lady’s ring was gorgeous! Back to the shard ring...again! I was trying to find out what is so appealing to me (besides being a gorgeous stone). I think it's the lack of V prongs at the ends. It seems to float out of the setting. I also like the flowing lines leading up to the stone. I must STOP obsessing over the ring! MissyBeaucoup, stracci2000, Bluegemz and 1 other person like this. Your topaz ring....the stone is such a perfect shade that it almost looks fake. What a beautiful find! I remember seeing it for the first time in another thread and it invoked such a strong feminine yet quiet power to it. If a stone had a gentle but powerful energy id say its that delicious stone! To get all weird and metaphysical....what would you describe its initial energy as or any feelings or words that you get when wearing or holding it? I really love that you share the love of this ring! What great observations...I’d not thought about the lack of V tips, but now that you mentioned it, I agree that it has a much lighter, floating feeling to the stone. It’s attached to the base, but also reigns over it independently, but the setting serves the stone. When I first saw this ring, I was impressed by its extreme proportions and the flow of the setting. I hadn’t seen anything quite like it lol. And I couldn’t stop thinking about it after that. Thank you for the kind words! You really expressed what it feels like wearing it. It’s very feminine, gentle, but powerfully secure. The main feeling which I get is feminine soliditity and stamina, and therefore a sense of optimism. It’s also a really private piece of jewelry. It’s not a piece that others comment on often, even though it gets noticed. Im aware of it most of the day when I wear it, unlike other pieces which I have, which kind of forget about during the day. MissyBeaucoup, ilovegemstones and TheGarnetGirl like this. The "shard" ring is so very interesting. That stone is simply marvelous. And the shoulders look like tulips to me! Can you say how you came to own it? Sometimes those perfect pieces find their way to us in mysterious ways. It’s funny looking back, but I bought it in winter, year before last. I was browsing jewelry to tune out during a break at work, when I stumbled upon it. I was intrigued because it seemed so unusual, and reminded me of a birth of a sensuous joy, a still kind of being-ness which I had not experienced with other rings. I remember showing the seller’s Picture to my office mate who always asked me about my jewelry. Her facial expression seemed to show that she didn’t know what to think. She would never wear something like it and tried to formulate positive things to say lol! I think it must have been outside of what she’d seen before, as it was for me too. I had to laugh when remembering the conversation.., I realized then that it might be a love or hate kind of ring with little in between. I was definitely on the love side, growing increasingly obsessed with it. I showed my husband and told him why I loved it. He fully understood the inspiration and eventually we bought it a few weeks later. It came from a lady who bought it while on a trip in Brazil. She described a small jewelry store in which the jeweler made settings for specific, mostly local stones. It was not worn, so it was in pristine condition. I had to bargain her down, but we eventually agreed. 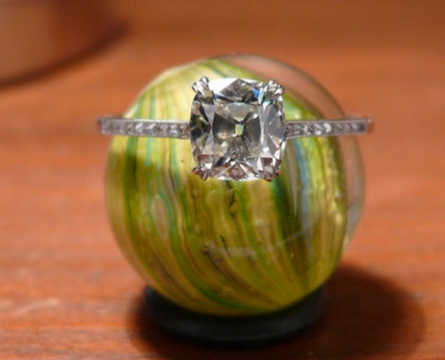 The setting is definitely made by hand to for the stone. I’ve been told that with topaz, often shapes are cut to fit the crystal, in which this is clearly the case with this stone! Hence the long, slim shape. And I love that about it, because I can sense the original crystal in the stone. Here is the seller’s pic....the pink is over emphasized in these pictures, but I suspected that might be the case. Never asked for other pictures because I wanted to buy it for the feeling of the entirety of the piece. With this ring, the color mattered less to me than the whole piece, since I knew it was an original thing, hard to find again. ( and I don’t like copying designs) I think, aside from a more cool based, less saturated pink in most lights, this picture captures the lines and design of it. Stone Hunter, MissyBeaucoup, stracci2000 and 2 others like this. MissyBeaucoup, stracci2000 and Bluegemz like this. Not at all! Thank you so much... I love mixing polish with rings. It’s like getting the most of the color moods out of each ring. @stracci2000 , how did your navette ring come into your life? How stunning this ring is! I love when stone cuts reflect the original crystal shape, like Old Mine diamonds and elongated rectangular cuts on beryls and tourmalines. A while ago, I was obsessed with vintage agate rings. I was scouring Ebay when I came upon this one. The shape and color won me over. I was really looking for dendritic agates, but this one was interesting. The ribbons of color are so beautiful the way they change with the light. Stone Hunter, TheGarnetGirl, MissyBeaucoup and 2 others like this. Those are all gorgeous. What an amazing collection! I have always admired agate, and the type with the black, brown and red in a clear base reminds me of modern art. I’ve never had a piece made into jewelry, but I’ve long wanted to! I’ve seen some amazing cabs which I’ve wished I could just set myself! I first became interested in dendritic agate what I saw a fabulous ring at a local gem and mineral show. The sellers we're a husband and wife team, the Attaways, from Sandia Park, NM. Steve is the gold smith and Nancy is a world renouned lapidary. They have a piece in the Smithsonian's permanent collection. They always have a spectacular booth at the annual Albuquerque Gem and Mineral Show. They had a man's ring in a heavy gold setting featuring a very fine dendritic agate. A transparent marble shape with black spots like a Dalmatian, set in yellow gold. I was in love. I was really taken by this ring, but it was out of my budget! That's when I started looking for dendritic agate. The first one I bought is that oval on my ring finger under the navette. It is 1930s vintage, from Ebay. That spotty stone still thrills me when I wear it! Omg! I know them. My husband purchased the aquamarine flower brooch from them. They are the sweetest people and they have gorgeous pieces! I can imagine how amazing it was. Just this past show, they had a lepidolite, gold and pink spinel necklace and earrings set...the lepidolite from Taos. I really wanted that too because lepidolite is so interesting, and it’s a ‘depression’ stone since it is colored by lithium! Yes, Nancy's work is world class. And you have one of their pieces! Lucky you! I was at a music event recently and a woman was wearing a gorgeous pink sapphire and tourmaline pendant. I commented on it, and if course it came from the Attaways! They also are in the OnyxSwan gallery in Abq's Old Town. I spoke to them there recently, and drooled on the case! OMG, I just lookedl at your aquamarine brooch on the other thread. Wow!! Breathtaking! I don't know how I missed this post! I really need to finally buy something from them at the next show! Thankyou so much! I absolutely fell in love with the brooch. The design works for so many applications ...I’ve worn it so many ways now, including as a pendant. It gives an impression of an eclipse. I was really impressed with all of thier things, and the movement in the designs. Did you see that large black star sapphire pendant? I really loved that one too. Well, I missed the gem show Oct.5-6-7 because I was out of town. This was the first time in maybe 10 years that I didn't go to that show. So I missed the Attaways and your brooch! There will be a spring show in March. I know I’ll have to go if I can. I bought some small opals, and a rose quartz stone...and of course, I feel good about having indirectly purchased from them ( the brooch was a surprise gift) because they struck me as true, old school artisans following a love of jewelry and stones matching individuality of their things. I fear that many of such artisans might be slowly disappearing as, in general, on a mass scale, people chose more mass produced things and/or popularized looks. So, I feel best about jewelry purchases when supporting such people because how tiresome/Impersonal would things be without their contribution to the world? AV_ and MissyBeaucoup like this.